Spring is here and along with the season we can expect the usual raining and flooding. It is important to have a plan and the supplies in place for those times of extreme water levels, especially if you are in an area that is often impacted by floods. Being ready for a flood before it happens is the best policy and it is pretty easy to do. The goal is just to stop the water before it can do damage. There are several ways to do this but still the favorite and most effective flood supplies are sandbags. No one plans a flood and they usually happen with little warning so equipment that can be moved and deployed quickly is of utmost importance. Sandbags are easily stored ahead of time because they can lay flat and do not take up much space at all. Once there is a flood danger reported, they can be quickly put into action and since they are flexible they can be lay upon each other and fill gaps to keep water out. 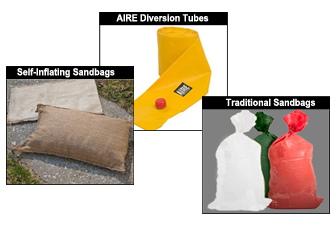 Many choose to use traditional sandbags that can be filled with sand. A sandbag filler can be used to speed up the process of filling the bags. AIRE Diversion Tubes have become increasingly popular because they are environmentally safe and quick to fill. Another interesting alternative are self inflating sand bags. When these bags come in contact with the water, they absorbe the water quickly, filling and creating a barrier. Protect your property and be ready for flooding water by researching your options and planning ahead. With the easy storage of this type of equipment and the quick set up, there is no need to be caught unprepared.